Valify Marketplace Recognized by CIO Review as one of the "50 Most Promising Healthcare Solution Providers - 2019"
As originally published in CIO Review: 50 Most Promising Healthcare Solution Providers - 2019.
institutions tasked to find cost savings. Additionally, there is an ever-present question that healthcare organizations can’t seem to find an answer to—how to balance the quality of services and solutions provided by vendors with the rates that they charge. 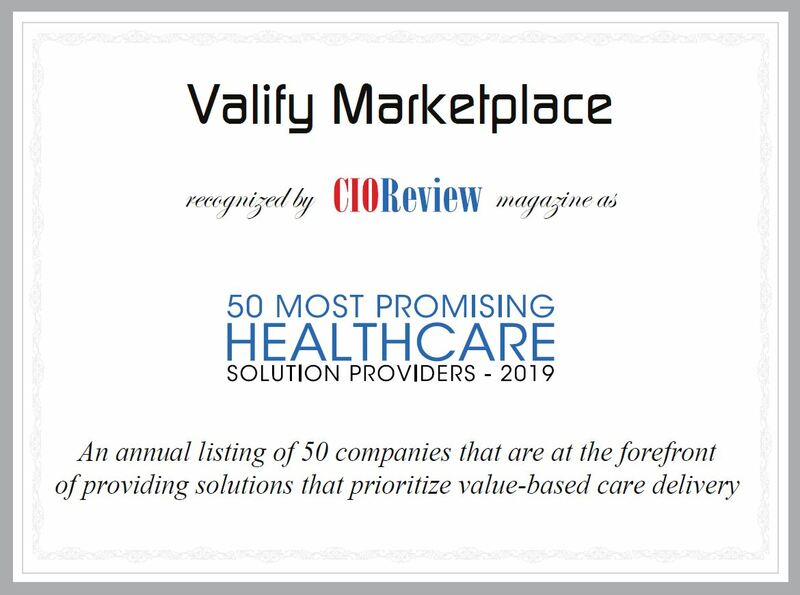 Valify Recognized by CIO Review as one of the "50 Most Promising Healthcare Solution Providers - 2019"
Despite best efforts towards reducing the overall cost of operations, healthcare companies often miss out on regulating one of their most expensive cost-drivers. Generally sidelined and overlooked, purchased services contribute to about 45 percent of a hospital’s non-labor budget. It is the vastness and uncertainty of outsourced services that bring complexities, making it difficult for hospitals to identify an appropriate service contract benchmark and derive savings. When hospitals outsource services, they can unwittingly fall prey to unnecessary costs which include duplicated services, hidden contract fees, and automatic price escalations. Valify, a company specializing in purchased services analytics uses a web-based solution that identifies, benchmarks, and monitors savings on purchased services categories. “We are the only company 100 percent dedicated to purchased services,” says Chris Heckler, CEO and founder of Valify. In order to mitigate the uncertainty in the broad description of indirect spend, Valify has classified the domain that has approximately 1,200 specialties into seven primary categories, namely, financial and administration, facility support, HR, insurance, clinical, ancillary, and IT-telecom. By working with the customer’s finance or IT division, Valify accesses the data and links the information to its solutions. The company then processes the data through proprietary algorithms and classifies them in less than 10 days. The firm also provides dedicated analyst support for the client to maximize the use of this information for savings opportunities. The evolution of supply chain management is having a significant impact on the overall success or failure of a hospital. Efficiency, transparency, and quality data will be critical to a health systems successful 2019 supply chain strategy. Simply following the same trajectory as years past with your existing supply chain isnt going to provide results in the future and could potentially do some harm. Hospitals and health systems need to transform their supply chains - aiming for best-in-class operations. A normal day at Valify, a leader in healthcare purchased services expense management, includes meticulous sorting and categorizing of countless and widely varying purchased services expensesfrom medical gas to snow plowing transactions, and anything in between. Our mission is to help hospitals navigate the twisting, winding maze that is the healthcare supply chain and significantly impact their purchased services cost reduction goals. Recently, however, the Valify team stepped away from our keyboards and offices with another mission in mindto lend a helping-supply-chain-hand to our community. Valify recently attended theHealth Connect Partners(HCP) Hospital Supply Chain Fall Conference held in Chicago from October 17th to 19th. The goal of HCP is to connect providers and suppliers through educational meetings and conferences. By bringing providers and suppliers together through industry-specific conferences, including Hospital Pharmacy, Hospital O.R. & Surgical, Radiology & Imaging, Hospital Supply Chain and Hospital & Healthcare I.T, HCP accomplishes its mission of providing the best in healthcare education and networking. In addition to connecting with peers, attendees were given access to cutting-edge informational sessions, participated in reverse EXPO sessions with industry leaders, and increased their brand visibility and exposure. FRISCO, TXandNASHVILLE, TN,September 16, 2018 (BUSINESS WIRE) --Valify, the leading healthcare cost management company exclusively dedicated to controlling purchased services expense, today announced that it has acquired Lucro Solutions, Inc., a Nashville-based digital platform for health systems to compare and select vendors. When providers think of purchased services, their minds typically go to facility support, IT, and ancillary services. However, this scope is too limited and doesnt encompass the full breadth of what falls under the definition of purchased services. The fact is, there are over 250 clinical services that are categorized as a purchased service including pharmacy compounding services, dialysis services, imaging services, and neurology services. Key takeaways from recent webinar on Dialysis coming soon! A large percentage of a hospitals overall cost structure is comprised of staffing and related payroll. Yet, the outsourced staffing industry does not maintain adequate transparency when it comes to managing costs to the end users, making price assessments difficult for health systems. Below we've compiled the key takeaways from our recent educational webinar in which we provide information for health systems to more easily assess pricing and best practices when evaluating Staffing and Locum Tenens vendors. Read the synopsis below. Click hereto request the full webinar recording. Also check out our in-depth articles onStaffingandLocum Tenensfor additional background information. Dialysis is a necessary procedure that allows nearly 500,000 patients in the United States with kidney failure the opportunity to live normal, productive lives. The treatment removes waste, salt, and extra water when the native kidneys are no longer able. Though there are several types of dialysis, the most common is Hemodialysis, in which blood is removed from the body, run through a dialyzer, cleaned, and replaced into the body. Dialysis takes three hours to complete and is offered by health systems as inpatient and outpatient treatments.